The Gurkha Cellar Reserve is one of three cigars unveiled in 2011 by Gurkha Cigars that is targeted as brick and mortar retail exclusive. The 2011 releases by Gurkha offer something for different pallets of cigar enthusiasts. The Gurkha Royal Challenge represents a milder offering. The Gurkha Seduction is targeted for those who enjoy something in the medium strength/medium body range. The Cellar Reserve is aimed at cigar enthusiasts who prefer a stronger, cigar closer to full-bodied. I recently have had a chance to sample this blend and I feel it is the best blend of the Gurkha releases for 2011. The Gurkha Royal Challenge and Gurkha Seduction went back to Gurkha’s tradition of elaborate packaging and banding. The Gurkha Cellar Reserve takes a bit of a different spin. I would not say it returns to the simplistic packaging of 2010’s Ninja and Viper. Instead it goes in an angle more toward innovative packaging. The cigars are packaged in a wine barrel-shaped box. At the same time, the banding is meant to resemble a wine label. Let’s break down the Gurkha Cellar Reserve in some more detail. Like the Seduction, I like the fact that Gurkha is targeting this blend at the cigar enthusiast who prefers a larger ring gauge. At the time of this assessment, there are five vitolas available. For this cigar experience, I selected the 6 x 60 XO vitola. I placed a straight cut into the large cap of the Gurkha Cellar Reserve and commenced with the pre-light draw. The dry notes provided me an interesting mix of cedar that had both sweet and spicy characteristics. In some ways, the spice actually seemed more like classic pepper. Given that this was an interesting pre-light draw, I was excited to light up this cigar and see what was in store. The sweet/spicy cedar notes on the pre-light draw were definitely more pronounced on the on-set. An interesting twist is that I picked up some natural tobacco flavors as well. While every cigar has a natural tobacco taste, this one seemed to be more unique – and blended with some of the cedar notes, it made for a nice initial start to the Gurkha Cellar Reserve. Eventually toward the end of the first third, I also noticed some cinnamon notes as well. Ultimately the cedar flavors were the primary ones. The second third brought yet another twist. Some citrus notes emerged. These citrus notes had a little more of a sour taste to them and seemed closer to grapefruit than anything. I also detected notes of chocolate in the second third. I was amazed how this cigar transitioned so much. The citrus, cedar, and chocolate would be the notes making up the flavor profile in the second third. In the last third, the cedar notes moved more toward a baker’s spice. The citrus notes diminished significantly. The chocolate and baker’s spice would dominate the last third and eventually the chocolate would diminish as well. Perhaps the biggest surprise was the nub – it was firm and cool to finish. This is something that is rare with a 6 x 60 cigar these days. The firm and cool nub was a direct result of a good burn rate and good burn temperature. As for the sharpness of the burn, the Cellar Reserve did require multiple touch-ups to keep it burning straight. The touch-ups seemed to do the trick, and prevented the burn from moving off track. As for the draw, this was flawless – no issues here. The Gurkha Cellar Reserve definitely had some pop to it. I think it just has enough power to qualify as a full-strength smoke from a nicotine profile. As for the flavor notes – there was definitely some depth to them. In the press release, Gurkha mentioned this was a medium to full-bodied smoke. For the most part, I would agree with this. I must admit, this did come very close to being a full-bodied smoke. 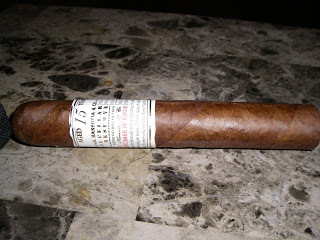 This was a solid smoke by Gurkha and as I mentioned this was my favorite of the 2011 releases under the Gurkha name. This cigar had a lot more complexity than I originally anticipated. In fact, it might be one of the most complex Gurkhas I ever had. The Cellar Reserve does deliver in terms of providing flavor. Some of the citrus notes at the mid-point were not in my flavor profile, but for the most part this was a good smoke. I’d definitely recommend this to a seasoned cigar enthusiast. As for the novice cigar enthusiast, I can see them gravitating to this cigar if the person wants a fuller smoke. I would definitely smoke this cigar again. Source: The cigars smoked for this assessment was a sample provided by Gurkha Cigars. The sample was initiated by Gurkha Cigars in order to provide feedback. I am appreciative for the sample, but in no way does this influence this review.